PVCu windows today are very different from the early generations of replacement windows. Modern PVCu windows are slimmer, better, more secure and more thermally efficient. Colour choice is also better than ever giving you contemporary PVCu windows. Anthracite grey windows with contemporary front door. When it comes to contemporary PVCu windows, grey is one of the most attractive colours. RAL 7016 Anthracite Grey gives a modern dark appearance to your windows. The choice of a window can have a remarkable effect on your property, especially when it replaces the standard white window. At SGK Home Improvements we provide the latest generation PVCu windows. You can choose from chamfered, ovolo or flat looking windows. The modern look is finished off with a choice of window handles that are secure, sleek and reliable. A new window with a satin or polished chrome window handle is a great combination. Contemporary PVCu windows in Woolton, Liverpool. 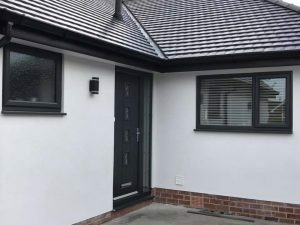 SGK Home improvements transformed a bungalow in Woolton, Liverpool with our exceptional range of modern PVCu windows in grey. These are the latest multi-chamber, energy efficient windows with an A rating. To achieve the modern look, the windows are foiled rather than painted. With foiling comes an entirely different appearance. We can provide either a grained or smooth effect depending on the look and texture you are looking for. To retain the modern appearance, we helped the homeowner choose the right design as well. The opening vents are large with no horizontal transoms, which contribute to creating a modern looking window with more glass area and less bulk. The bathroom window is a full top hung opening light. This design gives maximum ventilation and light transmission, even with obscure glazing to provide privacy. The contemporary PVCu windows work very well with the white walls and dark tiled roof of this family home. Contact your local contemporary PVCu window experts. If you are thinking of improving your home with a more modern appearance, contact us today. As well as our exceptional range of contemporary PVCu windows, we offer modern front doors, slimline French doors and even bifolding and sliding doors. Our consultation and quotation are free. SGK Home Improvements provide affordable, high-quality windows that will add value to your home. Contact us today.